It's all about the details! Incredible craftsman style remodel, nothing has been left out, this is truly a sanctuary. It all starts as you approach, with the extra wide Timbertec stairs and custom railings leading to a full sized front porch, creating the perfect getaway for some downtime yet inviting enough for entertaining. The tongue and groove ceilings and painted beams extend to the outside creating a full room of outdoor living space. As you progress through the double set of French doors, the style and attention to detail continues through the home. The living space is decked out from vaulted ceilings to the Brazilian cherry floors. The fireplace, with an Italian marble face stands out from the corner. The living space extends to the open concept kitchen, meticulously created with classic design. A full breakfast bar, the island, and the counter are all complete with Green Peace granite. The design is complete with a deep stone sink, glass-faced cherry cabinets, and a hidden refrigerator. A stunning custom glass faced cherry curio cabinet completes the package. The sunroom adds that extra space, with so much light to the home. It boasts floor to ceiling windows, a vaulted ceiling, and the cherry floors continue. A large 6' X 2' self-ventilating skylight adds that final touch of comfort and design. The oasis continues to all of the bedrooms from the dressing room off of the master, to the basket weave tile in the shower. Again, every detail was well executed including mango cabinets and onyx sink vessels. Travertine tile in the guest bath and rooms, and an exit out to the yard from the guest room. Once you step outside, through the second lanai space, off of the sunroom, the dream continues. A well-manicured and thoughtful designed landscape awaits. Plenty of exotic foliage ensures the Hawaiian feel including bananas, lipstick palms, and Saco trees. Sorry, your guests are never going to want to leave. For info and pics sent instantly to your mobile device: Text "3361" to 79564. SPECTACULAR Ocean Front Property with Up.... Ocean View 1936 Redwood Plantation Home Charming and Custom Beauty on One Acre! Immaculate, Upscale and Near the Ocean! Kipuka Village! Entirely Off-Grid Resort! Private Retreat! Ideal Luxury Getaway! NEW 3BR/2BA Home From HPP's Premier Buil.... 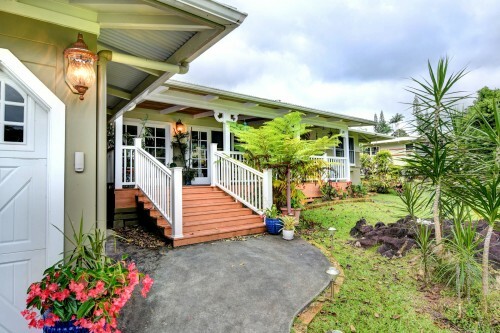 Historic Hilo Estate is an Eye Pleaser w.... Standing on Ethical High Ground: Basing .... Acreage on the Desirable Hamakua Coast! Lovely Hawaiian Living in Keaau! Hale Mauna Loa! Quintessential Volcano G.... Hale Mahana! Exquisite Vacation Rental! Colonial Revival Home Featured in BankRa.... Acreage on the Desirable Hamakua Coast! Waimea in Puna! 5.82 Private Acres! The Orchid Elua! One-Of-A-Kind Home! Something Special! give us a call at 808-987-4511 - We´re happy to answer all your questions.